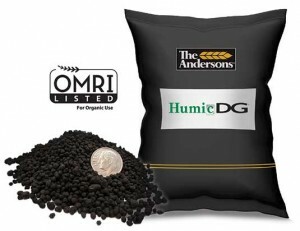 Humic DG combines pure dry humate and humic acid precursor in a homogeneous product featuring Dispersing Granule (DG) Technology. Humic DG contains 70 percent humic acid and 10 percent humic acid precursor. DG Technology creates a dust-free, spherical, ultra-dry particle that rapidly disperses into thousands of particles upon contact with moisture. Humic DG contains a complete spectrum of humic substances – fulvic acid, humic acid and humin. While increasing phosphorus uptake, Humic DG also enhances nitrogen efficiency and micronutrient availability. Humic DG improves water penetration, increases CEC and improves soil structure. While competitive products are non-uniform, dusty and contain up to twenty percent moisture, Humic DG granules are uniform, dust-free and contain less than ten percent moisture. Humic DG handles well and is easy to spread – with the ability to be blended with all fertilizers, including urea.